Worked-All-Germany Contest is a typical "Single-Country-to-DX" contest with a long lasting tradition and more than 2000 log submitting participants plus several thousand more active. So WAG generates about 10 000 individual hours of competetive or relaxed activity and fun. You can collect German DOK for several DARC awards, especially the DLD which is supported by the DARC Community Logbook. Our participants between 10 and 95 years of age report about the enjoyment of meeting a lot of old and new friends, going to unsual locations like qrp-expeditions to hilltops or sharing experience with rookies of all ages at Multi-Operator Stations. Thanks to everyone who participated in the 58th edition of the WAG Contest. We have received 1809 logs from 73 DXCC/WAE entities. In total, our log software counted 6658 active calls in the contest, which brought it to a total of 465384 QSOs. Among them are 2185 unique calls, i.e. callsigns that appear only once in all logs. We have sent a log checking report (UBN) to all entrants by email. Online certificates are available now. The final results can also be found on the DARC Contesthub. From 2019 there will be two new additional categories: SSB high and SSB low. The fact that the contest-free segments on the bands are respected by the participants is pleasing. On this amateur radio weekend, the contest-free areas will serve to ensure as interference-free a coexistence as possible with the simultaneous JOTA activity of the scout groups. QSOs detected by the evaluator in the contest-free segments are subtracted from the participants. This year there have been three warnings for self-spotting. According to the general DARC contest rules, selfspotting is not allowed. Congratulations to all winners and we hope to hear you again in the WAG Contest 2019! Thanks again to the WAG evaluation team DL1RTL, DL1DTL, DL8MBS and DL6KVA, thanks also to DJ0ZY for the support with the log upload and the evaluation software. 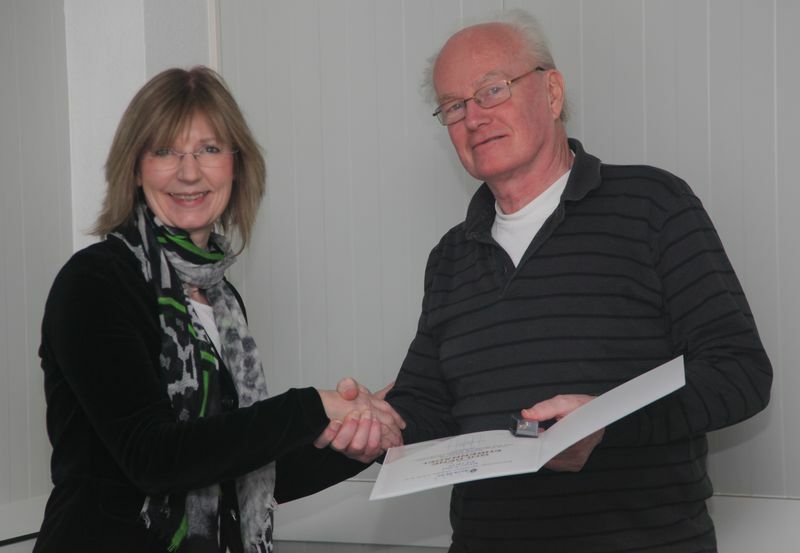 Annette Coenen, DL6SAK, member of DARC board, honours DL1DTL with the "Goldene Ehrennadel" of DARC.